A wonderfully selected chronological taste of Fats Waller from his first piano solo up through the glorious ensemble swing of 1935. Many recent U.S. attempts at a Waller sampler seem haphazard by comparison. Ever since the deletion of his entire Bluebird catalog, the European labels have been a great source of consolation for disgruntled admirers of this man's music. One irritating shortcoming of most American reissues has been an apparent reluctance to include more than a thimbleful of Waller's exciting material from the 1920s. Nearly half of the sides included here date from before 1930. This allows the listener to follow the growth of the young Thomas Waller and to arrive at a greater appreciation of his impact upon the world. Here is Fats cutting a hot piano solo at the age of 19, daring to play such stuff on the pipe organ a few years later, and incorporating both instruments into hot ensembles, resulting in some of the toughest records of the entire decade. (All that's missing is the knuckles 'n' know-how piano solo "Blue Black Bottom" of 1927, but you can't have everything.) Waller was the first jazz organist, and the inclusion of two organ solos makes this disc all the more valuable, even if the liner notes imply that he didn't record with the organ between the years 1929 and 1942. (On the contrary, Waller's 1935 recording of "Night Wind" is among the loveliest of his organ performances, and he trundled the instrument out on a regular basis throughout his career, particularly during the year 1939.) Only three of the 1929 piano solos are included, but they illustrate perfectly why all of Waller's piano solos need to be made available and kept in circulation for the rest of time, possibly protected by an act of Congress or a United Nations resolution. For these are masterpieces worth contemplating over and over again. For the purposes of this CD, three will do, but there are plenty more piano solos where these came from, and one can never have enough. The inclusion of a piano duet with Benny Payne comes as a surprise, as previous compilers have often seemed to resent the presence of a second pianist, but indeed there is something exciting about hearing Cab Calloway's piano man interacting with Fats. "I'm Crazy 'Bout My Baby" from 1930 (like "Red Hot Dan" of 1927) is an early glimpse of Fats the Vocalist. Even more than his piano, it was Thomas Waller's voice that made him into a nationally famous recording artist by the middle of the 1930s. 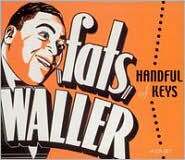 Nine examples of Fats Waller & His Rhythm (recorded in 1934 and 1935) round off the album beautifully. Nearly every side they made in these first couple of years as a working unit had this fresh and cheeky quality. As time passed, some of the charm would occasionally fade as producers kept handing Fats ridiculously lousy material. Waller in 1939 or 1940 could sometimes sound just a little bit tired of Tin Pan Alley rejects. "A Porter's Love Song to a Chambermaid," on the other hand, is the perfect example of this artist's undiluted joie de vivre. What you have here then is Waller at his very best. Hopefully it will inspire some folks to go out and pursue the rest of his recordings, even if they have to purchase them from the French or the Dutch or the Swedes. Recorded live at NBC Studios and The Yacht Club, New York, New York in 1938.